Here I will explain how to upload multiple files / images with drag and drop in asp.net using ajax fileupload control in c#, vb.net with example or show progress bar while uploading files using ajax file upload control in asp.net example in c#, vb.net or upload files with progress bar using ajax fileupload control in asp.net with examples. By using ajax fileupload control we can upload multiple files / images in asp.net with drag drop and we can show progress bar while uploading files easily with few configurations in c#, vb.net with example. In previous articles I explained asp.net mvc upload files to server or folder, angularjs upload multiple files using angular file upload in asp.net, jQuery upload files / images without postback in asp.net, display images from database using handler in asp.net, Bind Dropdownlist selected value in asp.net gridview, gridview rowdatabound event example in asp.net and many articles relating to ajax, gridview, asp.net, c#,vb.net and jQuery. Now I will explain how to upload multiple files / images in asp.net with drag drop and progress bar using ajax fileupload in c#, vb.net with example. 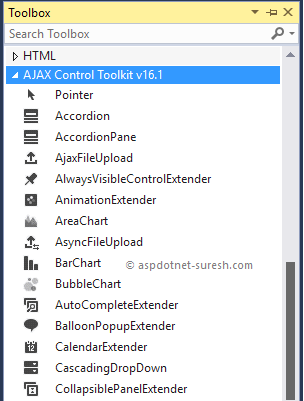 Before we start implement the code we need to install Ajax control toolkit in our visual studio for that download the file from this url Ajax control toolkit. Once downloaded the file start install it and follow the instructions which showing in screen automatically it will install all the controls in visual studio. Once installation done ajax controls will be like as shown below in visual studio. If you observe above AjaxFileUpload control we added multiple properties by using those properties, we can set our restrictions while uploading files. AllowedFileTypes: By using this property we can restrict type of files that need to be uploaded. MaximumNumberOfFiles: By using this property we can restrict number of files that a user can added to upload queue. OnUploadComplete: This property will call server side event to upload files and it will raise whenever we click upload button in Ajaxfileupload control. Now add uploads folder to your application to upload files once finished adding folder then open code behind file and write the code like as shown below. Now open web.config file add following handlers to avoid Ajax fileupload errors while uploading files. Once we finished adding all the details now run the application and check the output. Following is the demo of uploading files in asp.net without page refresh using Ajax fileupload. This is how we can use Ajax fileupload control to upload files in asp.net without page referesh or postback. Can you please post your sample codes/projects? Not working in Internet Explorer.